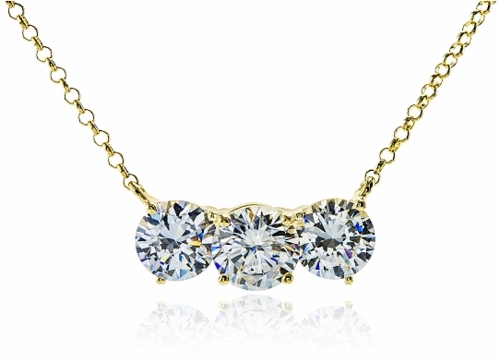 The elegant Three Stone Round Horizontal Anniversary Necklace is beautifully crafted in a classic shared prong mounting. Featured with a stunning 1 carat round center stone and .75 carat round stones on either side, for a total carat weight of 2.5 carats. 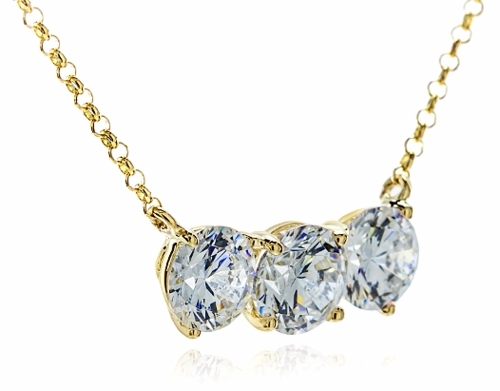 The brilliant Russian formula cubic zirconia stones set in this necklace are all hand cut and hand polished to exact diamond specifications and provide you with a finished piece that will surpass your expectations. Available in 14K Yellow Gold or 14K White Gold and comes standard with a 16 inch fine rope chain. 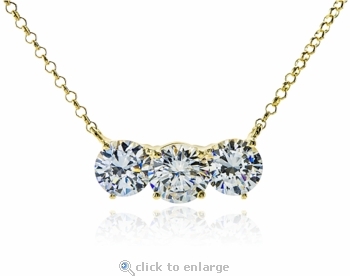 An upgrade to an 18 inch necklace length is available. Please see the pull down menu for options. For further assistance, please call us directly at 1-866-942-6663 or visit us via live chat and speak with a knowledgeable representative.